Going to a bar is one big common thing for a lot of people on their weekends. Why not advertising in such a area, which is well visited, by a broad range of people. Customized and branded bar mats are just the right product to get noticed by customers and bar-keeper. Such a product is really useful in bars as this is not only protecting the bar from violence by drunk people, but also promoting your brand. Many brands are using such branded bar mats to generate a increase in brand awareness and sales. These are such brands like: Dewar’s, Jägermeister, Guinness, Grey Goose, Smirnoff, Bacardi, Strongbow, Newcastle Brown Ale, Bombay Saphire, Skyy Vodka, Aperol Spritz, Martini to just mention the most known ones. 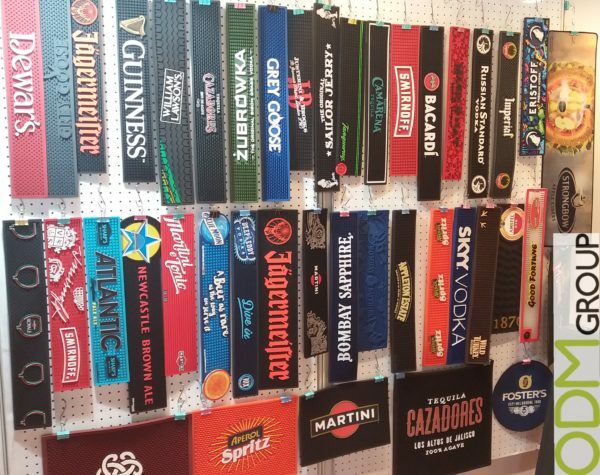 These brands have realized through a long term use of such branded bar mats, that this is a great way of spreading the word around your brand and to gain a big increase on the sale. A branded bar mat is customizable and can implement your logo on many different ways and in many different shapes. Bar mats are not only customizable in shape and branding, but also in their material. Bar mats can implement a lot of different materials and can therefore catch the eye of the customers even more. This also can comunicate that your company does care about the environment. Such bar mats are not only good for bars and clubs, but also to promote your brand at events to gain a increase in consume and therefore sale of your brand. Brand awareness. Imagine siting on a bar and seeing such branded bar mats in front of you while having your drink. This kind of situation is a common situation, which a lot of people know just to well from evenings of the weekend in bars. To have always a look, where you put your drink down will definitely gain the brand awareness of the customers. Also will a unique design, like the wooden one really catch the eye of your customer and will make sure he will spread the word around it. Additional costumers. Most of the bars have big menus of possible drinks and meals. Many people can get swamped by such big options at the bar. To have such branded bar mats will help them to choose their next drink and will make the choice really easy. At ODM we have significant experience in product design, sourcing and manufacturing. We can help you with your marketing budgets effectively. Be sure to contact us if you are interested in finding out more information about such branded bar mats. Please also find branded bar mats related links below.